I've had several requests to share more line art along with the finished color work. To satisfy those requests and pass some time while I finish up some more work, here is the line art for two recent Supergirl covers. 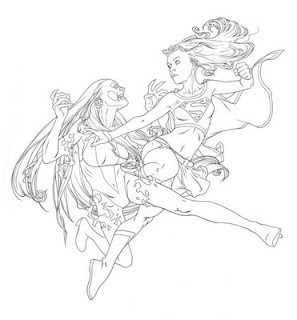 Both are drawn in ink, but the Supergirl versus Silver Banshee image is drawn in my more typical fine-line style, with great attention given to each line. 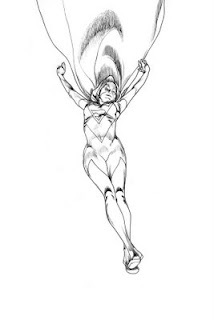 On the other hand, the Superwoman descending image is a little bit of a departure in that I first sketched the figure in blue pencil with a fair amount of midtones and rendering. Unsure of how to approach the final line art, I eventually threw caution to the wind and went at it with the pens, replacing the blue shading with linework. If you go back and look at the final color version in my October 18th post, you will see that I wound up coloring out a lot of the linework anyway, but it did serve as a good foundation for the color by injecting some movement in the line. How those first strokes go down on the paper can really influence the final look of an image, no matter how much time we spend on it. It is sometimes good to mix things up a little in the early stages to force a new approach when finishing the image- more opportunities for experimentation and the blessed happy accident. Also, for those folks who have been contacting me about purchasing original art, I will have more art available soon (including the above drawings), so please keep checking the blog for updates. Thanks very much to everyone for their interest.